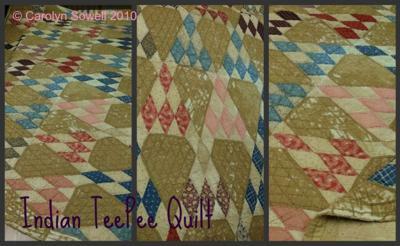 This well-worn Indian TeePee quilt belonged to my maternal grandparents, Steve and Minnie Williams, of Upshur County, Texas. The pattern is also sometimes referred to as "Pyramid" or "Sugarloaf." In 1946, to extend the usefulness of the quilt, the Williams' daughter, Mabel Williams Sowell (my mother), tacked a covering made of feed sacks over the top of the quilt. The sacks had contained turkey feed for the turkeys in a student agriculture project taught by my father in Frankston, Texas. The quilt accompanied our family on many outings -- picnics, ice cream suppers, and campouts. When I removed the turkey feed cover in 1986, I was surprised to find this very primitive, obviously well-used quilt underneath. Mabel came from a large family of 12 children, many of whom were very resourceful with their hands. The maker of the quilt could have been any of the number of her relatives. Cotton seeds can be felt in the cotton batting -- indicating that the carding of the "raw" cotton was not performed very carefully. Maybe this was a first quilt made by a young girl. We don't know, but it is fun to speculate. Fabrics and colors are of those used from 1890 to 1900. Characteristic blue, red, black, maroon prints with shirting prints of red, beige, or black on white. It is set with home-dyed tan muslin, which was also used for back. The back of the quilt is a coarse fabric, possibly hand-woven.